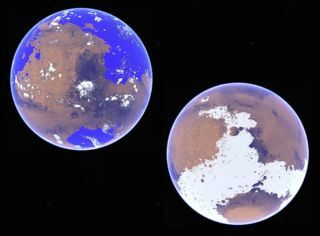 New research suggests that ancient Mars, rather than being warm and wet (top, left), was more of an icy snowball. Crashed comet lander Philae phones home. A dead satellite falls to Earth. Mars shows both methane-laced meteorites and a possibly icy past, and the moon's dust gets a source in the best of this week's space news.